Located in southern California, San Diego occupies 372 square miles with its 1.42 million residents. The city is bordered by the Pacific ocean to the West and the Mexican border to the south. San Diego has a mild climate with more than 200 days over 70℉, wintertime lows reach 50℉ while summertime highs top 78℉. San Diego lies within Hardiness Zones 8a, 8b, 9a, 9b, 10a and 10b, and boasts over 40,000 acres of park assets. 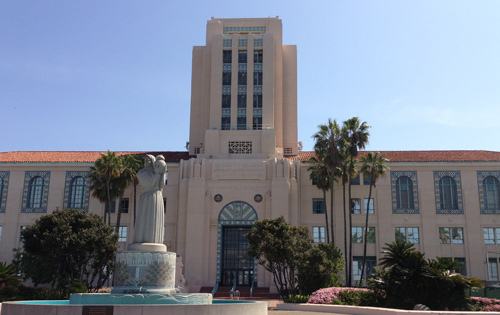 As such, San Diego has established a tree ordinance to protect its tree canopy and offer guidelines for tree removal. Following is an excerpt from http://www.treeremovalpermit.com/california/san-diego-ordinance-permit-city-arborist/, which explains the San Diego, Ca tree removal permitting process and requirements in detail. In the event you are intending to remove a tree that requires a permit, this information will educate and guide you through the process. Council Policy 900-19, Public Tree Protection, provides for the protection of designated trees. These trees are Landmark, Heritage, Parkway Resource, and Preservation Grove. If the above conditions apply, the below will guide you through the permit application process. Download or print the City of San Diego No Fee Tree Permit Application or call the No Fee Street Tree Permit Line at (619) 236-5513 for assistance. • Fill in all applicable information to the best of your ability/knowledge. • For tree planting, your selection of species must be consistent with the community’s street tree plan, or match existing species in the community. When planting or replacing a tree, visit the City’s Street Tree Selection Guide at https://www.sandiego.gov/sites/default/files/street-tree-selection-guide.pdf to determine which tree species should be planted. In the event of sidewalk damage from removal and replacement activities, the property owner is responsible for the repairs of such damage. The required City permit for sidewalk replacement can be obtained by contacting Development Services at (619) 446-5000. Note: If the area your activities will occur in falls under San Diego County jurisdiction, fill out the Application to Plant, Remove or Trim Shrubs or Trees in County Road Right of Way, and submit it to the County of Sand Diego Department of Public Works. To submit your No Fee Street Tree Permit Application in person, schedule an appointment at the Development Services Department at (619) 446-5300 or contact the Street Tree Coordinator at (619) 236-5513. You can make contact via email at dsdstreettreepermit@sandiego.gov for other alternatives.